The Varsity Boys Spartans have developed a reputation as smart, fast-skating, tough competitors. More importantly, the program has turned out young men with the maturity, leadership skills and perseverance to succeed. The Spartans are consistenly in the top ranks of the MPHL, and our players have frequently turned up on NHL Draft watchlists. Our graduates move on to NCAA and Canadian universities in addition to junior hockey programs. VB Hockey vs BCS @ MPHL Bowers Div. 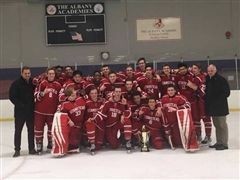 For the third year in a row, the Spartans are travelling back up Interstate 91 with hardware in hand. 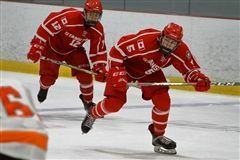 As the Varsity Boys Hockey Spartans head to their first MPHL weekend in Burlington, Vt., it’s time to look at who’s on the team.